Sizzling Bacon Tea Towel « Gluttoner: You gonna eat that? Dry your hands off with bacon! I once tried exactly that and all I ended up with was some greasy hands. Now, yes, they were greasy with delicious bacon grease, so no complaints there, but they were not dry. 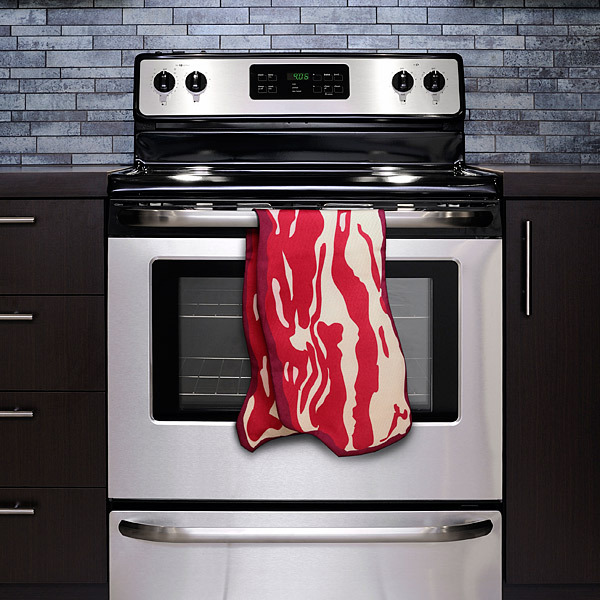 Problem solved- Sizzling Bacon Tea Towel. It’s not actually made of bacon, it’s made of 100% polyester which is double the polyester of those inferior 50% towels you have now. This towel is long, it’s strong, and it’s about to get the bacon on.